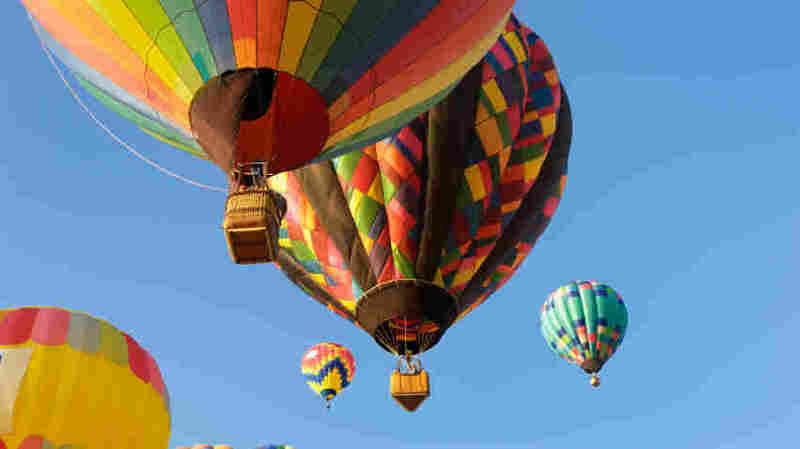 Hot Air Ballooning: Transcendent, Until You Break A Leg : Shots - Health News Hot air balloon tours are popular with tourists and people looking for the thrill of a lifetime. But accidents can cause injuries and death, a study finds. Leg and ankle fractures were among the most common serious injuries. Most of the problems happen when balloons land badly. Maybe your bucket list includes taking a hot air balloon ride. Sounds lovely. But before floating aloft, please note that coming back to Earth can hurt. Almost half of the 169 hot air balloon crashes reported from 2000 to 2011 in the U.S. involved tourist flights, and 83 percent of the 78 tourist crashes caused at least one serious or fatal injury, a study finds. Five people died. The most common serious injury was lower body fractures, according to Dr. Sarah-Blythe Ballard, a graduate student at Johns Hopkins Bloomberg School of Public Health, who led the study. "People were having broken legs, broken ankles," Ballard told Shots. That's not surprising, she says, because hard landings were a factor in most of the crashes. Collisions with fixed objects accounted for half of the serious injuries, including trees, power lines, buildings and the ground. Four of the deaths involved people ejecting from the gondola. "You talk to some people and they say, 'Oh, we just floated to the ground, it was so great,' " Ballard says. "Then I imagine someone like my grandmother going on one of these and God forbid she breaks her leg or breaks her hip." I've only been ballooning once, but I remember the landing as a mad scramble to get out of a basket that tipped on its side while being dragged on the ground. Broken bones hadn't crossed my mind, but it's easy to see how that could happen. Pilots are required to give passengers a preflight safety briefing, but they're not standardized for ballooning the way they are for the airlines. So there's no way of knowing what people were told. In two crashes, pilots failed to give passengers helmets even though they were recommended by the balloon's manufacturer. Those crashes caused three head injuries, one of which lead to the death of the pilot. This may be quite enough to demolish your fantasy of floating with the breeze, but it comes with a big caveat — no one knows how dangerous ballooning tours actually are. Ballard gleaned this data from the National Transportation Safety Board's accident analysis database. Her results were published in Aviation, Space and Environmental Medicine. But there's no data on the number of balloon tour flights each year in the U.S., so there's no way to know how often tour flights crash, or the overall risk. "I suspect that these crashes are actually underreported," Ballard says. More recently, 2013 was not a good year in balloon tour safety. In February, a tourist balloon caught fire over Luxor, Egypt, and crashed. Nineteen people died. In May, three tourists died and more than 20 people were injured when two balloons collided in Cappadocia, Turkey. If you are considering a flight, Ballard says, pay close attention to the safety briefing and wear a helmet. "Really understand the safety brief," Ballard says. "Really understand what's going to happen during the high-risk situation, which is the landing, and be prepared to handle that." Ballard got to wondering about balloon tour safety because she specializes in preventive medicine. And she's also a pilot. While serving as a Navy flight surgeon, she flew P-3 Orions and heavy Marine helicopters. During tours in Iraq and Afghanistan, she also investigated crashes. She's currently in Peru, studying children's health as part of her doctoral research. OK, Dr. Ballard, what's it going to be? Aviation safety or global health? "I'm actually interested in both," she says. "I really like getting to the root of a problem and making recommendation as far as safety and morbidity and mortality outcomes."